Where I am on January 28, 2016 is where I wanted to be this time last year. When February rolled in last year I said, "OMG, it's February." Repeat that and insert each of the remaining months and that's how my year went. Last year FLEW by, and I was so disappointed in myself about what I hadn't yet accomplished. Fast forward to the new year, I didn't make any resolutions and I still didn't have a plan. I had cleaned and organized my little writing space to death, hoping that less clutter would bring peace and inspiration. I sat in my refreshed space and said, "Now what?" By the 6th of January I had not blogged my first post of the new year, so I checked in with the Finish the Sentence group to see what the prompt was. We had to name our word for 2016. I chose Peace, and posted my piece later that evening. It wasn't so much my commitment to choosing peace that got me in gear that weekend. It was all the other "one word" posts that I read. 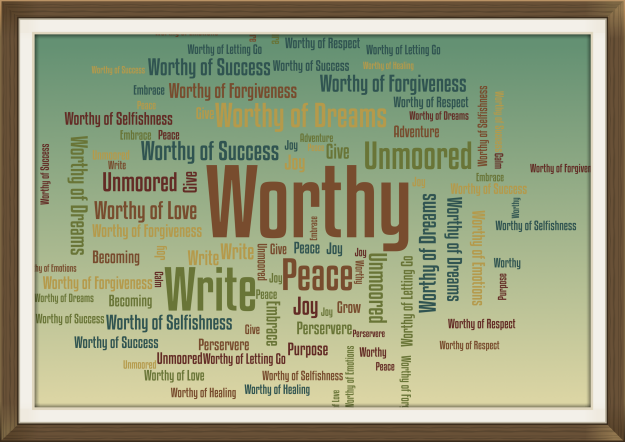 I was so inspired about each word that I wanted to create a word cloud, frame it and put it on my wall. I asked Madra Sikora, how she created the word cloud she used in her post. Word Cloud using App Wordsalad and Inspired by Chris Carter and other FTSF bloggers. In my Peace post, I wrote that I was going to get my peace in the 5:00 hour, so Chris' post energized me to get up the next day. Still reveling in all of the "words" I read over the weekend, I went back to Mardra's post to see if she answered me. She had used worditout.com to create her word cloud. I wanted an app, so I searched for an app for that and found Wordsalad. In the course of typing out the word cloud for all the inspiring one-words, I had the BIGGEST aha moment. In an instant the design for The Christopher Chronicles 2.0 came to me. It was the missing piece to my puzzle and once I found it, everything moved along very quickly. I'm not ready like right now, but I'm done procrastinating. Some day will be soon. In 2015, I learned that time flies whether you're having fun or not. Don't hesitate, don't procrastinate, it's never too late to start all over again to get yourself on the right path. If you ever get blog weary, think about how our community has impacted your life. I've been blessed by this one so many times and in so many ways. Linked up with Finish the Sentence Friday where writers/bloggers finish a sentence prompt. The sentence this week “In 2015, I learned…” hosted by Kristi Campbell from Finding Ninee, and co-hosted by Vidya from Collecting Smiles and Kerry of Her Headache.